Public Health Panorama, volume 2, issue 3 has been published to coincide with the 66th session of the WHO Regional Committee for Europe (RC66) and the presentation of the Action plan to strengthen the use of evidence, information and research for policy-making in the WHO European Region. This new issue of Panorama contains a treasure trove of articles exploring how countries are bridging the gap between evidence and policy in different ways and situations. In her editorial, WHO Regional Director for Europe Dr Zsuzsanna Jakab gives her views on how the Action plan and RC66 represent “collective commitment” to making “a real difference to health and well-being in the Region”. In another feature, Minister of Health of Portugal Adalberto Campos Fernandes gives a policy-maker’s perspective on the relationship between public health and policy, and explains how Portugal is putting health information at the centre of decision-making. 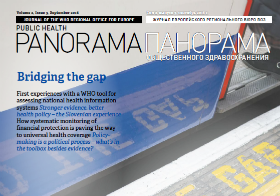 The issue features one article on Slovenia’s approach to tackling evidence-informed policy-making within its unique local context, and two more highlighting the specific situations of small countries working with the Small Countries Health Information Network. It offers a larger-country perspective in an article on Germany’s development of regional health information systems. The issue also provides insight into the Region’s progress towards universal health coverage, and highlights an interdisciplinary approach that has veterinarians and doctors working together in Uzbekistan to counter antimicrobial resistance in poultry. This is the 6th issue of Public Health Panorama. The journal has been so popular that the editorial team is currently planning publications into 2018. Future editions will cover topics such as nutrition, noncommunicable diseases and human resources for health.